Exquisite color, skilled craftsmen, and creative designs have made Blenko famous in the ancient craft of hand-blown glass. Over the years, talented designers have developed contemporary new designs for our skilled artisans, who have learned the difficult techniques of glass blowing through many years of practice. The uniqueness of hand-blown glass cannot be compared to that of machine-formed glass - a process which produces items all exactly alike but without character. Because our glass is made in small batches and our processes are performed by hand, it is common to observe small air bubbles, lines or individual marks left by our craftsmen. These are not flaws - but rather the distinctive nature of the hand-made process - which identify and magnify the uniqueness of each piece of glass. In a world of increasing automation and standardization, we at Blenko pride ourselves in paying particular attention to the forms and designs, which stay true to the tradition of hand blown glass. We all need - now more than ever - hand made objects that are unique and inspiring. For over 100 years Blenko has maintained the tradition of handmade glass. William J. Blenko- The Blenko Glass Company was founded in 1893 by William J. Blenko in Kokomo, Indiana. He was born in 1853 in London's East End, on 36 Wharf Road. He worked in London glass houses when he was 13 years old and eagerly learned about glass formulation. In 1893 he came to America with the intention of starting the first glasshouse that could supply mouth blown (Antique) sheet glass for stained glass windows. 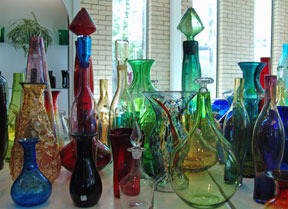 At this time, all antique glass was produced in Europe (France, England, Germany) With the exception of Blenko Glass, it is still the same today. William J. Blenko arrived in Kokomo, Indiana and set up a small shop. In time, he hired and trained other glass workers. William remained in Kokomo until 1903 when economics in America forced the factory to close. As a curious side note- William Blenko gave a solo piccolo performance on the evening of Tuesday, Feb. 13, 1894 in Kokomo. Over the years, William became aware of the prejudice against American-made glass. Since the studios were owned by former Europeans, they had a natural bias in favor of European glass. William Blenko faced this prejudice until he died. In1909 he started a factory in Point Marion, Pennsylvania, and later in Clarksburg, WV. Unfortunately, both of these ventures failed. A letter indicates he was working in Bellaire, Ohio in 1919 at an unknown glass factory for $40.00 a week. William was at some time offered a job at Tiffany's in New York for $50.00 a week and he apparently took this job. Finally in 1921, he decided to move to Milton, WV because of the low natural gas prices there. William was now 67 years old, an age when most people retire. Working by himself, he blew the glass cylinders, flattened them into sheets and then went on the road in his Model T car to sell them. The original name of the company was Eureka Glass Company. It was called this because William J. Blenko spent years trying to find a ruby red sheet glass that would not change colors when painted and fired. When he developed this color, he threw his arms in the air and said, "Eureka, I've found it!" In 1923, his 26-year-old son William H. Blenko Sr. , with wife Marion and two-year-old son William Jr. joined him in Milton. This is when the factory finally took off. William H. Blenko Sr. had the energy, ideas and an astute sense of sales. By 1927, Eureka antique sheet glass was specified for the Liverpool Cathedral. In 1929, sales were slow due to the depression in America. Bill Sr. seeing a need to make more business, contacted a Boston Importer, named Carbone. Carbone was importing his glass vases from Venice, Italy. Bill Blenko told him he could manufacture them, and save Carbone money. In reality, Bill Blenko did not have the skilled men to make them. When he returned to Milton, he found two Swedish glassworkers to work part-time. They were brothers Axel Mueller and Louie Miller. These two men were highly skilled in stemware manufacturing, and set the standard for all craftsmen to follow. The first samples were made in 1929. Thereafter, hand blown tableware was a major aspect of the Blenko business. ,When it was being excavated by the Rockefeller family.In 1933, William Sr .negotiated a contract to become the exclusive manufacturer for Colonial Williamsburg. This step was the beginning of Blenko producing fine tableware fulltime. William Sr. died in 1969. William H. Blenko Jr., was born in Lancaster, Ohio in 1921. After graduating from the Carnegie Institute of Technology in 1942 with a Bachelor of Science Degree, Bill Jr. joined the United States Air Force where he served in England as a Captain. This is also where he met his bride to be, Jeanne. In 1946, after serving his time in the 8th Air Force, William H. Blenko Jr., became the 3rd generation to join the family business of glass making. By 1969 Bill Jr. was appointed President of the company.